Here we bring you Dragnet, the 50's radio show detective series. True stories of crime occurrences from Old Time Radio. The documented drama of a national crime investigated and solved by the men who unrelentingly stand watch on the security of your home, your family and your life. In cooperation with the Los Angeles Police Department, you will travel step-by-step on the side of the law through an actual case from official police files. From beginning to end, from crime to punishment, this is the story of your police force in action. "The names have been changed to protect the innocent." 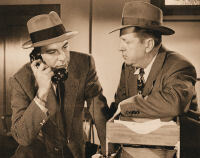 The story stars detective Sergeant Joe Friday (played by Jack Webb) in his career of solving crimes. Partners during the run of the show were: Sergeant Ben Romero (played by Barton Yarborough), Ed Jacobs (played by Barney Phillips), and Officer Frank Smith (played by Ben Alexander). 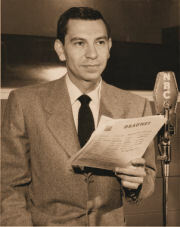 The series was created by Jack Webb and ran from June 3, 1949 through February 26, 1957. The shows were 30 minutes, and broadcast on NBC radio. 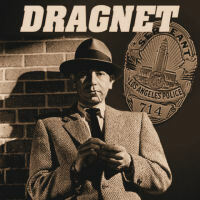 Dragnet eventually became one of the top rated shows on radio. Webb insisted on realism in all aspects of the show. Every facet of police work was chronicled - step by step: From patrols and paperwork, to crime scene investigation, lab work and questioning witnesses or suspects. The detectives' personal lives rarely took center stage. Topics covered included murders, robberies, missing persons, shoplifting and many other crime-related subjects. In later years (1950s and 1960s), the show ran on television in virtually the same format as the radio program. Come listen to Sergeant Joe Friday solve the crime mysteries! Now let's hear Dragnet the 50's radio show !